Co-sponsored by the Arts Research Center and the University of California Humanities Research Institute, the Center for Latin American Studies, and the Townsend Center for the Humanities. From war and human rights to cultural identity and domestic violence, Susan Meiselass award-winning photographic work covers a wide range of subjects and countries. 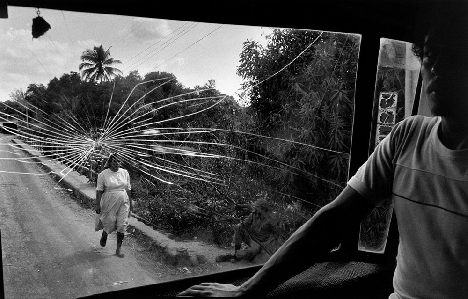 Meiselas received her BA from Sarah Lawrence College and her MA in visual education from Harvard University. A member of the internationally renowned photographic cooperative, Magnum Photos since 1976, Meiselas creates work that raises provocative questions about documentary practice, and the relationship between photographer and subject. Meiselass retrospective, Mediations, on view at SFMOMA until October 21, features projects from the beginning of her career in the 1970s to the present day, including her iconic portraits of carnival strippers and Prince Street girls, vivid color images of the revolutions in Central America in the 1980s, collaborations with survivors of domestic violence, and an ongoing investigation into the history and aftermath of the Kurdish genocide. In conversation with Natalia Brizuela (Film and Media, Spanish and Portuguese) and Leigh Raiford (African American Studies), Meiselas will discuss her photographic practice, intersectional feminism in photographic image-making, and the continued importance of photojournalism in a changing technological and geopolitical landscape.